Design Consultation: Clients receive a one hour consultation at no charge. We determine your style and immediate needs and follow up with a inclusive proposal outlining, costs, project phases and budget. Color Consultation: We offer a comprehensive paint consultation providing clients with a beautiful color scheme for their entire home. Space Planning: We develop a variety of floor plans for each design project. Floor plans include furniture layout, furniture selection, fabrics, color, wall covering, window treatments and flooring. 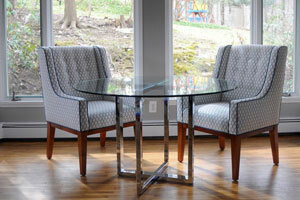 Furniture: We carry numerous furniture lines from New York City to North Carolina and California. Wall Paper: ​Full library of wall covering books cover the gamut from traditional, transitional and contemporary style. Accessories: All rooms are finished to the smallest detail. We carry a variety of lines ranging from lighting, art, rugs table top accessories. Professional Installation: Our Goal is to make the process of design simple. We follow the project from beginning to end including overseeing the installation and delivery. Construction/Remodel: We have experience in all types construction/remodeling; big and small. Our team of contractors, cabinet builders and handymen can complete your job in a timely and professional manner.